At Growcode, we consistently find shopping cart pages to be one of the most ignored parts of our clients’ sites. The focus of online retailers tends to be on optimizing product pages and checkout forms, rather than this intermediary page on which visitors review their purchase. Yet they’re absolutely essential for improving conversion rates and reducing cart abandonment. The most recent figures available put average cart abandonment at 69.89%, with around 10% variance either way depending on industry. That’s a high number. In order to reduce the number of people adding products to their cart and leaving the site without making a purchase, it’s crucial to take a broad approach. This sixteen-step checklist to abandoned shopping cart optimization will take you through the most important parts of improving your cart page. Let’s dig in. 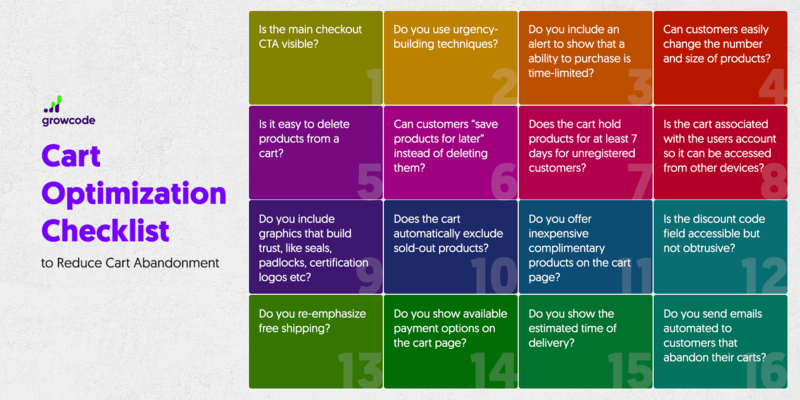 16-point ecommerce shopping cart optimization checklist. All in one. 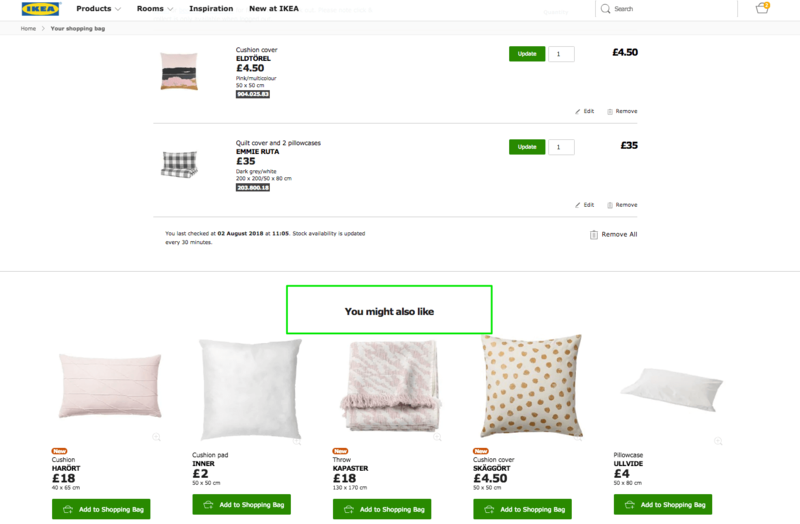 Is the main checkout CTA visible? Do you use some of the same urgency-building techniques that you use on your product page? 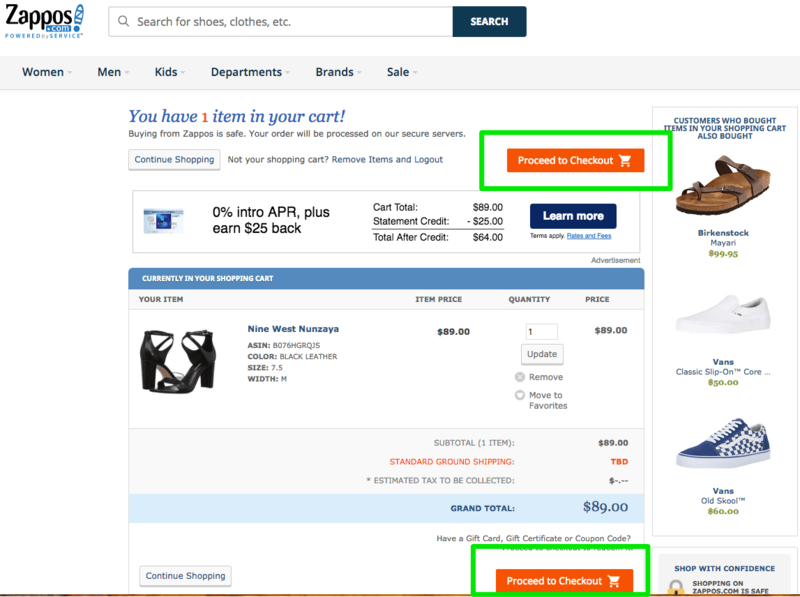 Can customers easily change the number and size of products in their cart? Is it easy to delete products from a cart? Can customers “save products for later” instead of deleting them? Does the cart hold products for at least 7 days (ideally 30) for unregistered customers? Is the cart associated with the users account so it can be accessed from different devices? Do you include graphics that build trust, like seals, padlocks, certification logos etc? Does the cart automatically exclude sold-out products? And communicates this action to the user flawlessly? Do you offer inexpensive complimentary products on the cart page, such as tablecloths for people buying a table set? Is the discount code field accessible but not obtrusive? Do you re-emphasize free shipping? Do you show available payment options on the cart page? Do you show the estimated time of delivery? Do you send automated emails to customers that abandon their carts reminding them to complete the purchase? 1. Is the main checkout CTA visible? Visible CTA is a must. It should be in a contrasting color, easy to tap and in an imperative sentence that “orders” a visitor to take an action. 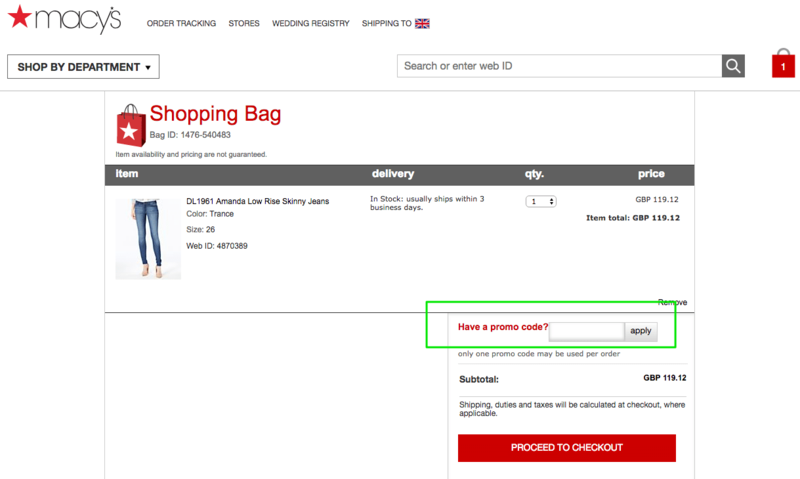 Don’t make it hard for visitors to hit the button to proceed to checkout! Including the button above the fold is one of those small tweaks that can have a significant impact on your product page conversions. You can also consider repeating it twice. 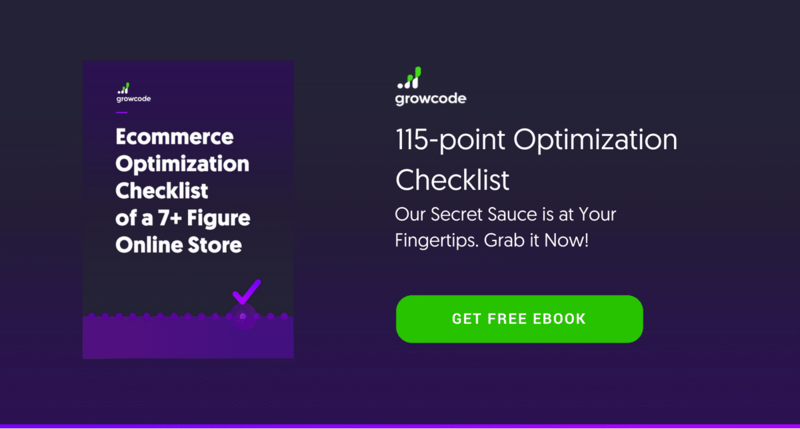 Btw, find out also our checkout optimization checklist to create a perfect combo. The main CTA is in a contrasting color and included twice on the page. Of all the cart abandonment reasons, this is one of the biggest. 2. Do you use some of the same urgency-building techniques that you use on your product page? Consider adding alerts indicating stock levels. The obvious example is to notify customers of “Low stock!” but you can also cleverly use notifications when you have high or medium-levels of stock to create urgency, irrespective of how many products you have available. 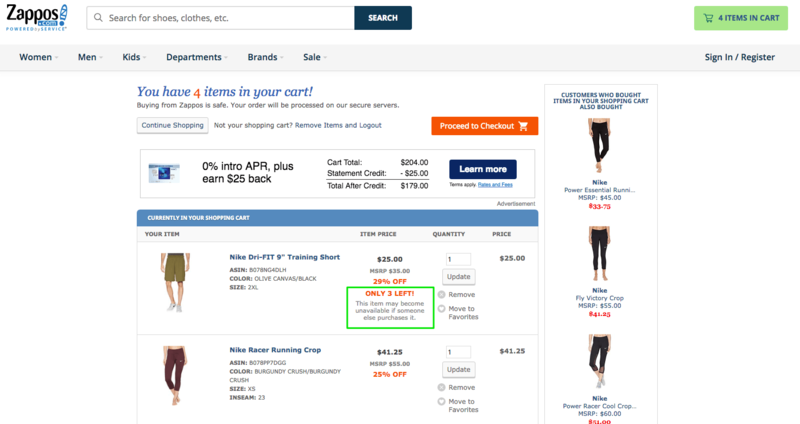 Zappos created the sense of urgency by showing the exact number of items left in stock. Thay also inform that it can be soon unavailable. It is a very powerful urgency-building technique. Such alerts are another urgency-building technique. Visitor may feel that he may lose the opportunity to buy this product so it prompts them to take an action. Creating urgency on shopping cart (as well as urgency on product pages) is one of the most effective ways of cart ecommerce conversion optimization. 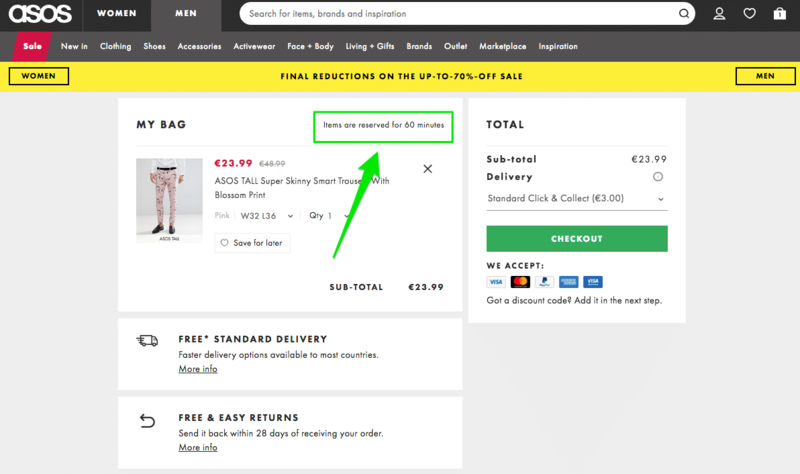 Asos gives you a possibility to reserve a product from the cart for 60 minutes with creates a sense of urgency and prompts the visitor to buy immediately or to continue shopping for some time. 4. 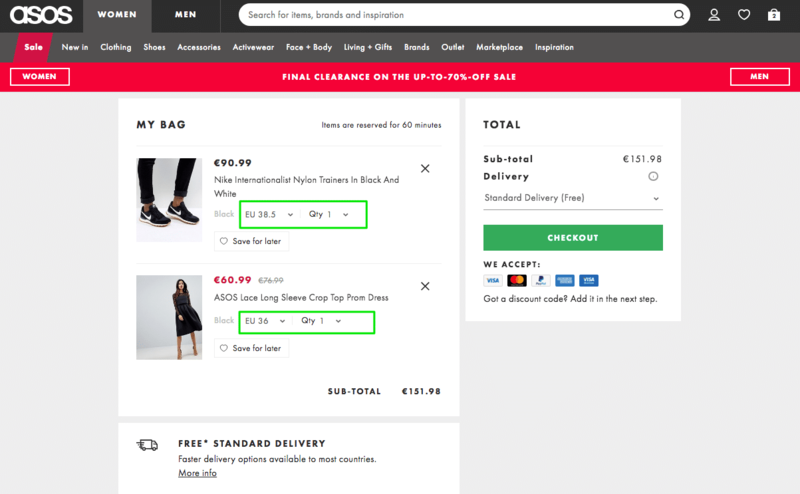 Can customers easily change the number and size of products in their cart? Frustration over an inability to change order quantities and features is a major contributor to cart abandonment. 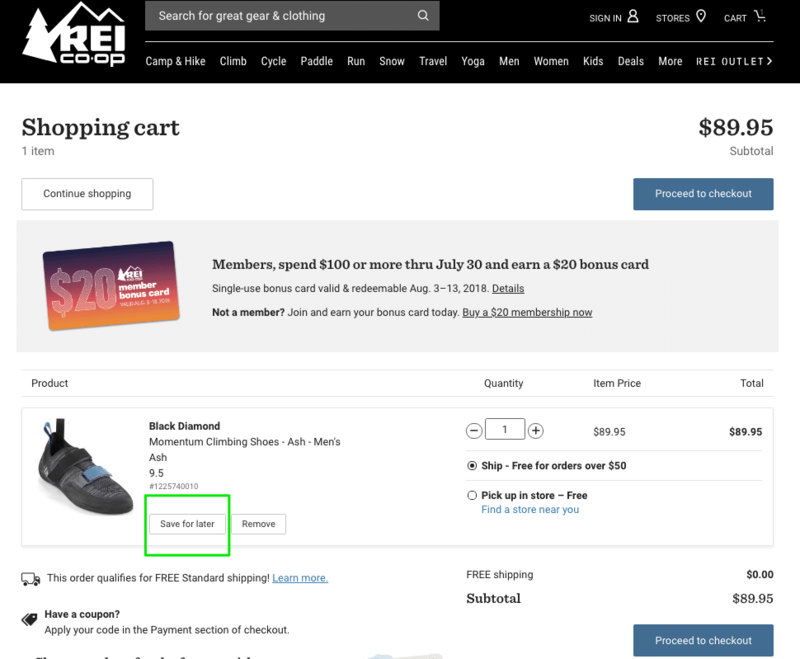 For those eager to learn how to avoid shopping cart abandonment and to know why visitors don’t add products to your cart, making the process of amending orders easier in every way is a valuable general approach. 5. Is it easy to delete products from a cart? A lot of retailers follow the flawed logic that if they don’t include a “delete” button, then users won’t get rid of items. This almost never works. What customers tend to do when they are unable to delete a mistaken order is to abandon the cart altogether. Ensure customers can easily delete products they don’t want. Nike includes a clear button underneath the product summary. 6. Can customers “save products for later” instead of deleting them? Every online retailer should give their customers an opportunity to shop later. If you don’t include such a possibility to save the product for later, visitor may abandon shopping cart and never come back. Allowing customers to “Save for later” is one of the easiest ways to increase the likelihood of future purchase. 7. Does the cart hold products for at least 7 days (ideally 30) for unregistered customers? Ideally, you should keep products in a customer’s cart for 30 days. Seven days is the absolute minimum. 8. Is the cart associated with the users account so it can be accessed from different devices? More than 50% of ecommerce traffic takes place on mobile. So it is now quite common for users to browse for products on mobile (btw. check how to improve your mobile checkout forms) and then completing the transaction on a desktop (or the other way around). So to keep products in the shopping cart it should be associated with users account. Reserved allows users to get back to their shopping after logging on other devices. 9. Do you include graphics that build trust, like seals, padlocks, certification logos etc? Security seals and images of certifications build trust and disper doubts on product pages and in the cart by leveraging the authority of brands that people recognize. The use of trust-building elements comprises a vital best practice for shopping cart abandonment. 10. 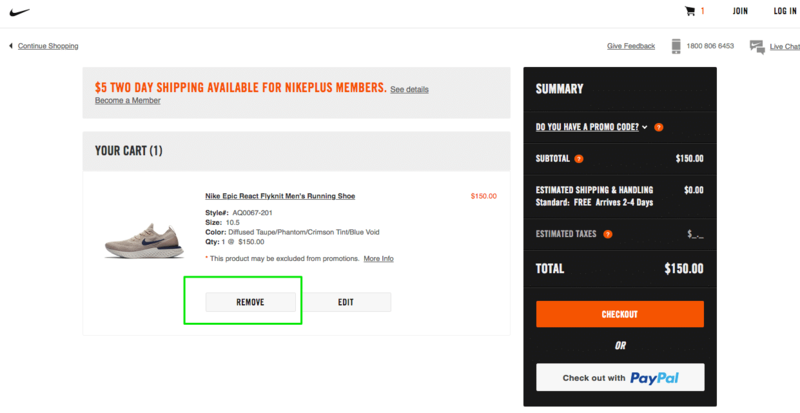 Does the cart automatically exclude sold-out products? And communicates this action to the user flawlessly? 11. Do you offer inexpensive complimentary products on the cart page, such as tablecloths for people buying a table set? It is important to follow the right recommendations strategy. If someone is buying products for the bedroom they should not be recommended a set of knives for the kitten. Also, the same products (even much cheaper) shouldn’t be there. IKEA shows recommended products that customer may like or need. They are complementary to those in a shopping cart. 12. Is the discount code field accessible but not obtrusive? Promo bar should not distract attention from the main CTA and encourage customers to leave the cart to search for promos online. Like Macy’s, include a promo code entry box but don’t “over advertise” it. 13. Do you re-emphasize free shipping? Free shipping is one of the most important USP and a factor that often prompts a visitor to choose exactly this online store and not another. 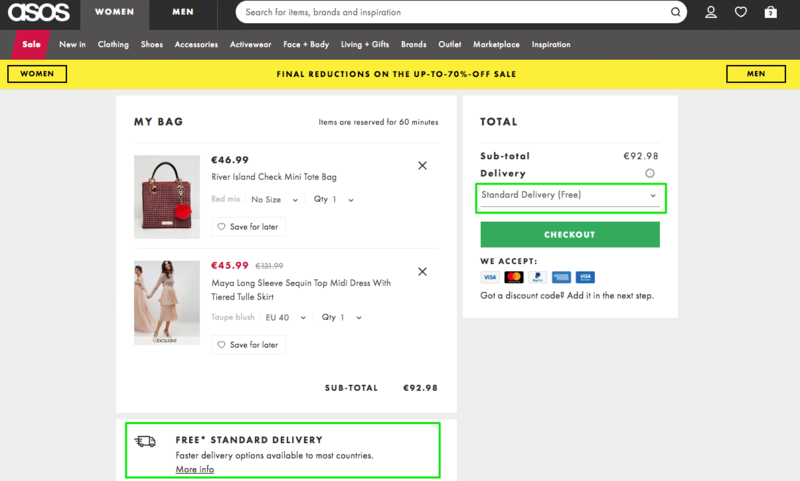 That’s why it is so important to emphasize free delivery not only on the main page and product pages but also in the cart where a customer is making a final decision whether to complete a transaction or not. 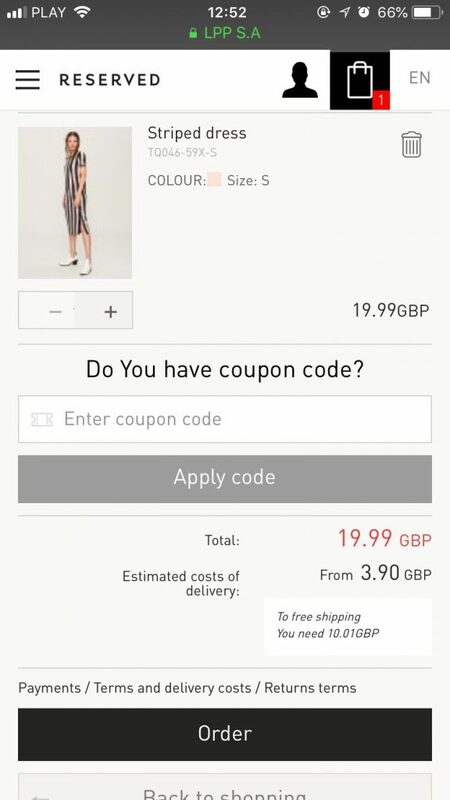 ASOS let customers know that their shipping is free twice on the cart page, just above the checkout CTA and at the bottom of the page. 14. 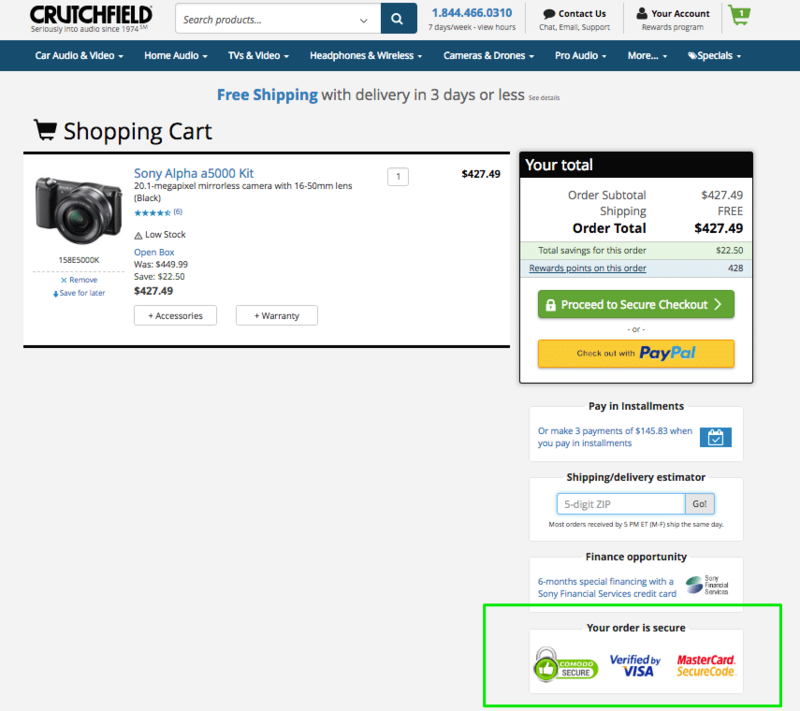 Do you show available payment options on the cart page? Customers won’t be ready to select a specific payment option at this stage, but it’s still worth showing images of what you have available for trust-building purposes. 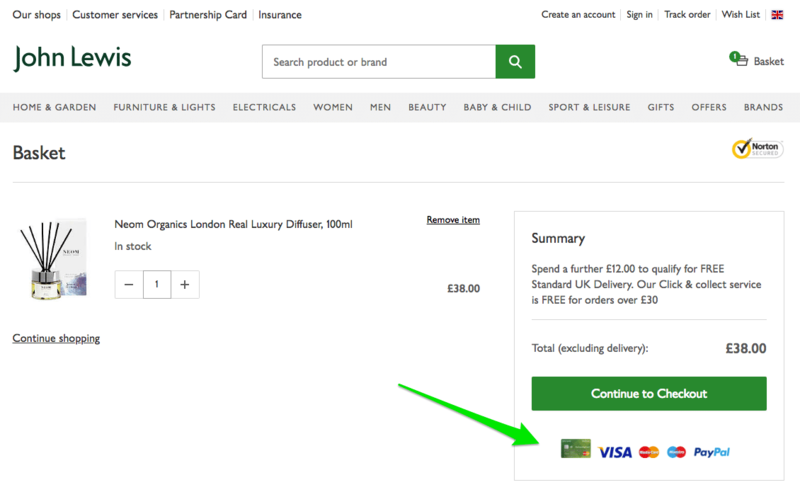 John Lewis allays doubt about checkout by letting customers know they’ll be able to use their payment method of choice. 15. Do you show the estimated time of delivery? Alerting customers to the estimated delivery time, as in the screenshot above, reduces hesitancy and the possibility of customers shopping elsewhere for the same product. 16. Do you send automated emails to customers that abandon their carts reminding them to complete the purchase? A significant part of shopping carts are abandoned before the customer completes a sale. Abandoned cart email is sent to a customer who has added products to their cart but failed to check out. Sending such emails can be an effective way to get the customer returned to your sotre to finish shopping. There’s no great complexity to building a cart page that does its bit to reduce cart abandonment. All of these tweaks are simple, effective and easy to implement. The real key is to ensure that you get rid of all the mistakes on your current pages, replacing them with effective elements. While one change may not have a drastic effect on conversions, multiple ecommerce optimization adjustments all add up. And the results can be significant. Also, remember about the importance of mobile shopping cart design! Serious about not only reducing cart abandonment but overall conversion rate optimization? Grab our free 115-point checklist!